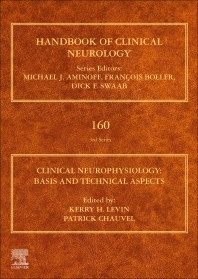 Clinical Neurophysiology, Part I, the latest release in the Handbook of Clinical Neurology series, is organized into sections on basic physiological concepts, on the function and limitations of modern instrumentation, and on other fundamental or methodologic aspects related to the recording of various bioelectric signals from the nervous system for clinical or investigative purposes. There is discussion of the EEG, nerve conduction studies, needle electromyography, intra-operative clinical neurophysiology, sleep physiology and studies, the autonomic nervous system, various sensory evoked potentials, and cognitive neurophysiology. Dr. Levin began his position at Cleveland Clinic in 1984 as a neurologist and currently serves in multiple capacities, including Chair of the Department of Neurology, Director of the Neuromuscular Center at the Neurological Institute, Program Director for neurophysiology and neuromuscular fellowships and Professor at the Cleveland Clinic Lerner College of Medicine, Case Western Reserve University. Twice awarded Teacher of the Year by the Neurology Department, Dr. Levin's specialties are electromyography and clinical neuromuscular diseases. Dr. Levin is a fellow of the American Academy of Neurology and of the American Association of Electrodiagnostic Medicine, and his been elected to membership in the American Neurological Association. He has held leadership positions in these and other professional associations and sits on the editorial board of Muscle and Nerve. The author of several books and many articles, Dr. Levin is also engaged in clinical research with interests ranging from the electrodiagnosis of radiculopathy and defects of neuromuscular junction transmission, to the treatment of polyneuropathy. After becoming an INSERM (Paris) researcher, Pr. Chauvel began his work in experimental and later clinical research into the mechanisms of the epilepsies. Under the mentorship of Talairach and Bancaud at Hopital Sainte-Anne, Paris, he developed SEEG (StereoElectroEncephalography) as a presurgical method in epilepsy surgery. His research work has been devoted to the neurophysiology of the epileptogenic zone, emergence of seizure clinical semiology in relation to intracerebral recording, and cerebral cortex physiology. He has promoted the concept of epileptogenic network over the classical epileptic focus idea, and opened new vistas in markers of the epileptogenic zone and pathophysiology of frontal epilepsies. Pr. Chauvel served as the Director of the SEEG Unit in Hôpital Sainte-Anne in Paris (1986-1990), then Professor and Chairman of Neurology in Rennes (1990-1997) where he configured a new type of Epilepsy Unit including research, then Professor and Chairman of Clinical Neurophysiology and Director of the INSERM Institute of Systems Neuroscience in Marseille (1997-2014). In 2014, he relocated to the Epilepsy Center of the Cleveland Clinic, in order to promote the development of presurgical investigation using SEEG in North America. He is the author of 250 original articles in international journals and is a member of several Scientific and Medical Societies, both French and International. He has been elected as a Member of the Belgian Royal Academy of Medicine.